Read article In patients with colorectal liver metastases (CLMs), liver resection still represents the only potentially curative therapy. However, during the last decade, it was observed that managing the patients with CLMs in a multidisciplinary teams (MDT) will improve survival rates. 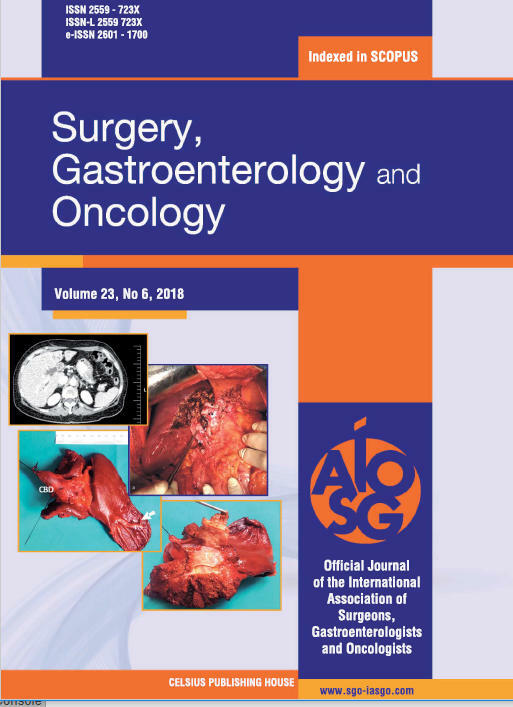 Read article Even though lymph node status is one of the most important predictors of survival for patients undergoing curative-intent surgery for peri-hilar cholangiocarcinoma (PHCC), the optimal lymph node staging system for PHCC has not been identified. Read article Introduction: Acute respiratory distress syndrome (ARDS) can cause severe morbidity and mortality after a pancreaticoduodenectomy (PD). However, very few studies have evaluated the risk factors for ARDS among patients undergoing abdominal surgery, with even fewer studies being performed for patients undergoing PD specifically. Metabolic Syndrome and Cardiovascular Risk in Liver Transplant Recipients - Can Non-invasive Testing Change the Landscape? Read article Objective: Liver transplant recipients often develop metabolic syndrome (MetS) and de-novo non-alcoholic fatty liver disease (NAFLD). Our aim was to evaluate the cardiovascular risk in these patients using CXCL10,a serum biomarker whose expression levels have been associated with inflammatory diseases. Methods: We assessed 60 liver transplant recipients for clinical and biological features. The cardiovascular risk was assessed using the Framingham risk score. Read article Background & aims: Prothrombin induced by vitamin K absence-II (PIVKA II) is a diagnostic marker and a major prognostic factor for hepatocellular carcinoma (HCC) with limited experience in European patients. The aim of this study was to investigate the clinical utility of simultaneous measurement of alphafetoprotein (AFP) and PIVKA II for hepatocellular carcinoma (HCC) diagnosis. Read article Background: Intrahepatic cholangiocarcinoma (ICC) is a rare malignant tumor arising from the epithelial cells of the intrahepatic bile ducts. The aim of the present paper is to report a rare case of centrally located ICC involving the hepatocaval confluence and generating a tumor thrombus in the biliary duct of segment 4 expanding into the left hepatic duct and main common duct, mimicking a type IIIB Klatskin tumor. Read article Although laparoscopic cholecystectomy is a well standardized technique, subtotal cholecystectomy is still a valid option in those cases in which a complete cholecystectomy is not feasible due to the anatomic conditions given by the underlying inflammatory status or when the absence of the Critical view of Safety (CVS) make unsafe to go on a complete operation. Various techniques are described to perform a subtotal cholecystectomy, both open and laparoscopic.